How to recover deleted Safari bookmarks on iPhone? This step-by-step tutorial explains you two methods to restore bookmarks in Safari on iPhone (iPhone 6s included). Download this powerful iPhone data-recovering tool to have a try, and then read this guide to learn how to recover deleted Safari bookmarks on iPhone, covering the latest iPhone 6s and iPhone 6s Plus. Various types of reasons can cause the loss of your Safari bookmarks, and mistaken deletion is one of them. Some iPhone users also have encountered the situation that their Safari bookmarks on iPhone are lost with no reasons, while other data remains in iPhone, which sounds weird but does happen. At that moment, the first thing you need to do is to restart your iPhone and check if lost Safari bookmarks are back. If that doesn’t work, you need to follow us with methods below. 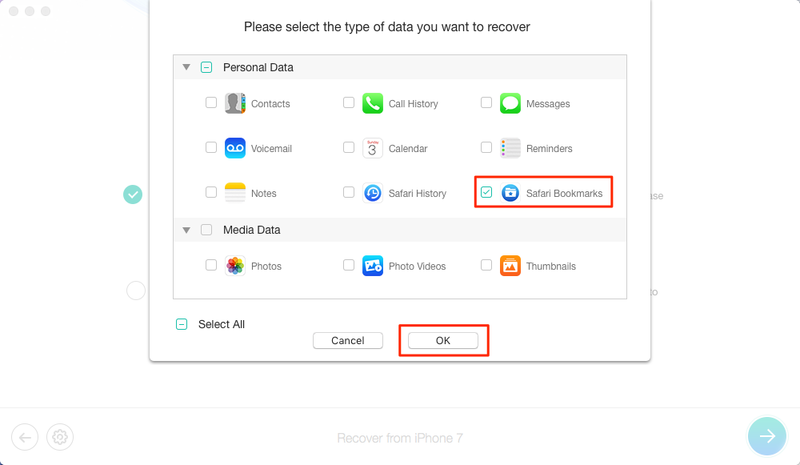 Here we provide you two quick and safe ways to recover Safari bookmarks on iPhone. 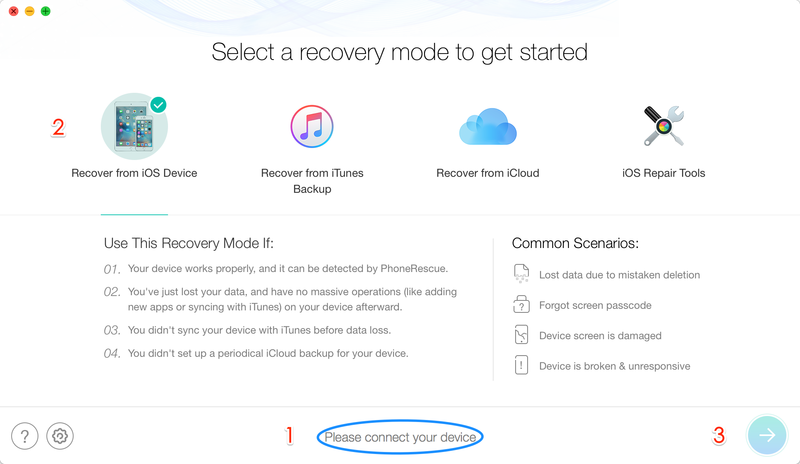 All you need is an easy-to-use iPhone data recovery tool named PhoneRescue for iOS. Manages to recover up to 25 types of iOS files on iPhone iPad, covering Safari bookmarks, Safari history, contacts, messages, call history, photos, vedio, notes, contacts, etc. Supports 3 recovering modes: Recover Safari bookmarks from an iOS Device, from iTunes backup, and from iCloud (for backup before iOS 9). 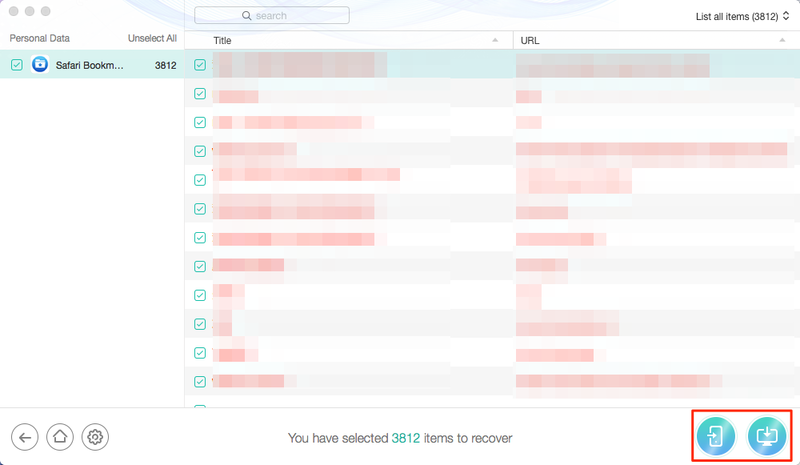 Allows you to selectively scan and recover deleted Safari bookmarks on iPhone instead of whole restore to your iPhone. Supports previewing detailed info of the deleted Safari bookmarks, like bookmark’s title, URL, etc. Go to the download page of PhoneRescue and click PhoneRescue for iOS to download it on your computer, then follow us. Step 1. Launch PhoneRescue for iOS > Connect your iPhone to your computer > Select “Recover from an iOS Device” > Click “Next”. This mode allows you to recover deleted bookmarks on iPhone directly. Step 2. Choose Safari Bookmarks and click OK button to scan your device. Step 3. Preview and select deleted Safari Bookmarks to recover. Tap “Recover” buttons on the bottom right to get deleted Bookmarks to iPhone or Computer. The whole recovery process will be completely finished in simple steps. Have it a try yourself. If you already backed up your iPhone before losing your Safari bookmarks, you can recover Safari bookmarks from iTunes backup. Here’s detailed guide you can follow. Step 1. 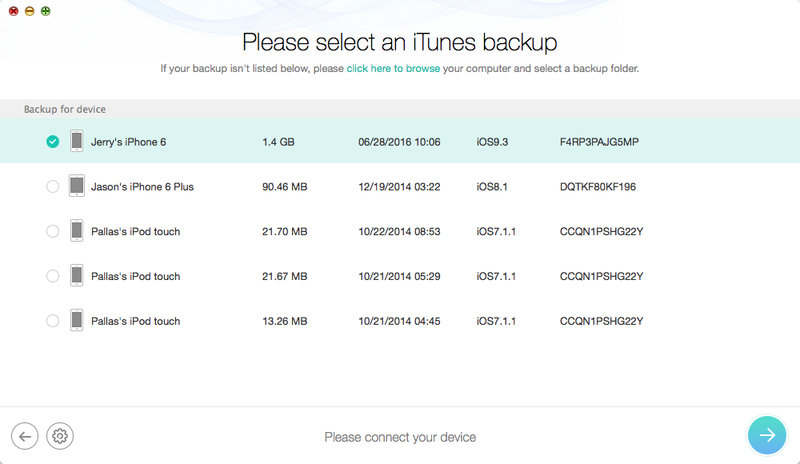 Launch PhoneRescue for iOS > Choose “Recover from iTunes Backup” option > Select a backup you need (PhoneRescue for iOS can check and show all backup files with iTunes stored on your computer in a list.) > Click Next. Step 2. 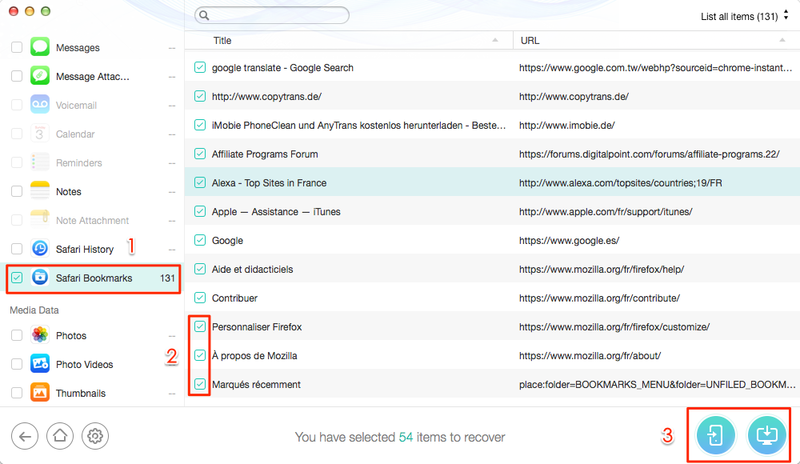 After scanning,you can choose Safari Bookmarks to preview all bookmarks in details and select items you need > Click “Recover” to save the deleted bookmarks to iPhone or your computer. No matter which method you choose, it can help you recover Safari bookmarks in an easy and quick way. Download it to give a try right now! Finally, if you have any questions or problems about this tutorial on how to recover bookmarks in Safari on iPhone, please feel free to let us know and we’ll reply to you soon.